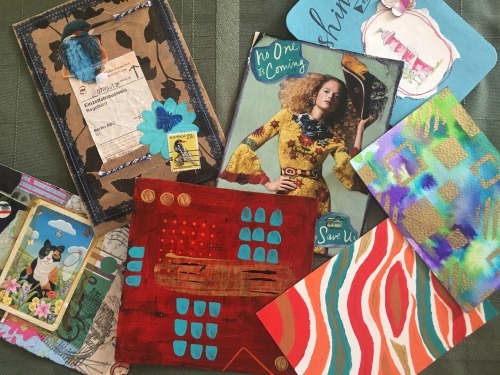 This spring, I decided to join my friend, Sue, and almost 200 other artsy-craftsy people across the globe in a #DIYPostCardSwap. It was one of two organized annually by craft blogger iHanna. The premise is that you pay a small administrative fee and prepare, send and receive 10 homemade postcards. 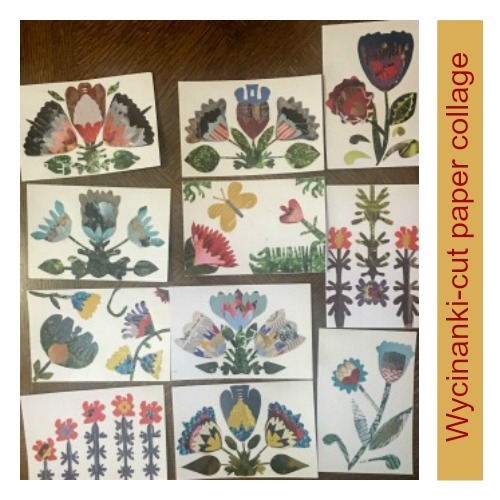 I toyed with a few ideas for the post cards I was creating before settling on a collage adaption of Wycinanki Cut Paper (Polish Folk Art). At first the famous Polish paper craft, with its roots in Jewish culture, seemed too intricate and complicated, but closer examination helped me break in down into parts. The patterns, often flowers or birds, are symmetrical and arranged in repeating patterns. I cut shapes out of magazine pages, folding the paper in half to get symmetrical pieces and put together my own not always repeating patterns. A quick coat of Mod Podge to protect the cut-outs I’d glued to the post cards, and they were ready to mail. Becoming more familiar with Wycinanki has given me ideas for other ways to use this colorful art form. I’m picturing surfaces in our garden that might benefit from the Wycinanki style treatment. Perhaps painting part of the block wall with repetitive flower patters as they do in Zalipie or to refinish bits of yard art that have seen better days. In this post card swap, participants receive before the appointed date, a list of ten individuals to whom their postcards are to be sent. My own list included folks in Norway, Taiwan, Scotland, and various states around the USA. I’ve received 9 of 10 cards so far in a variety of media and styles, and they’ve come from Austria, England, Canada, and many states, including a card from Tucson from my friend, Sue! They are currently on the door to my office. I’ve decorated it as if it’s my dorm room. It’s been a fun experiment, and it’s been a nice treat to look forward to checking the mail for a change! What a sweet idea and I love your cards Lois. You are not only a great cook and baker, but an artist too! Thanks, Jules! It’s something you can take up, making post cards for your adorable granddaughter! What fun! Yours ar beautiful, Lois! You’re very kind, David. It has been fun!